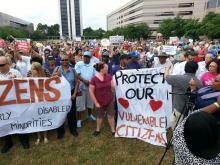 Biggest crowd yet at this afternoon's Mega Moral Monday protest on Halifax Mall in Raleigh. Over 150 committed civil disobedience and were arrested inside the General Assembly. RALEIGH — Jennifer Ferrell stopped for a moment, and her husband took her picture. She waved goodbye to her 3-year-old twins. Then she marched into the Legislative Building to get arrested. Rep. Garland Pierce, a Democrat from Wagram and chairman of the legislative black caucus, spoke to the crowd inside the statehouse and encouraged them to let their voices be heard. Carrboro Mayor Mark Chilton and other local elected officials were also among those arrested.